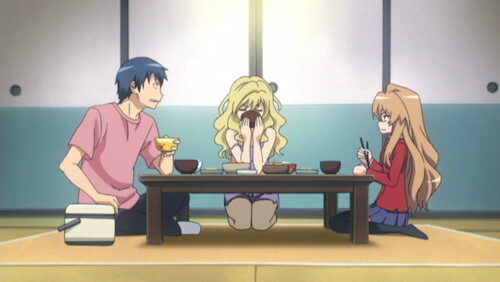 Well, I have to say this for Toradora: For a series that you can tell where it’s going to end up in the first episode, that does indeed go pretty much exactly there, I can’t think of anything similar that takes such an unexpected path along the way. Heck, even though in a general sense it ended where I expected it to go, it sort of didn’t—the whole finale was rather extremely not at all like what I was expecting. It was also unexpectedly romantic, in a functional, sweet, relatively mature “we’re in this together” sort of way. NIS's box sets certainly have lively cover art. The down side, to throw this out, are that some of the drama earlier in the second season is a little overblown, but then the characters are a little overblown so that’s not really much of a shock, and it’s not so extreme it lost me. Well, that and that it doesn’t end up being at ALL the kind of empty-headed series it appears at first glance, but that’s only going to be an issue if you go in expecting empty humor (which, to be fair, I would have been based on the box art, character profiles, and perky opening/end themes). Early on there's "drama," later on there's actual drama. It’s also either a little too long or a little too short; it takes its time getting to the meat in the first season, but that’s mostly to give you time to get into the characters and get a feel for how they function before stuff starts falling apart. The second season, though, is a little slow getting going for the first half; it could easily have been a few episodes shorter without hurting much, although I have the feeling cutting the whole thing down to a single season would have left it feeling jumpy and abbreviated. On the flip side, I wouldn’t have minded a third season (or at least a few more episodes) digging into what the secondary characters (Minori and Ami, in particular) do with their lives once the main pair get their stuff together (Kitamura pretty much had his big deal at the beginning of season 2). I suppose the logical conclusion of what I just said is that it should have cut two or three episodes out of each season and then spent those on the remaining characters, but that would have left the effective finale somewhere in the middle of the second season, which would’ve been weird. Heck, as it was the emotional finale comes halfway through the last episode. The show, to play the “boil it down” game, is a coming-of-age story, but of a somewhat different sort—in this case it’s about people who have major family issues and are trying to work through them. It’s about finding love, but rather than the usual coming-of-age blushing first love thing, it’s more about finding a soulmate and the making of commitments. Phrased differently, it’s less about the end of youth—which most such stories do—and more about the beginning of adulthood. It does this unusually well since several of the characters are prematurely mature—Aisaka has essentially raised herself sans-parents, Ryuuji is more a parent to his mom than the other way around, and of the three secondaries Kitamura is hyper-competent, Minori is wacky but also hyper-competent, and Ami has all kinds of premature maturity issues on account of getting into the working world way too young. What makes the whole thing feel particularly different is that it’s also about people who have it together totally losing it. Kitamura is the uber-youth-guy, and at the beginning of season 2 he implodes spectacularly; Minori seems to be either too crazy to have much going on inside and/or so together she’ll crazy her way through life comfortably, but she likewise is very sharp yet falls apart dramatically. Ryuuji is more of a slow burn, but even he eventually snaps and has to put things back together, albeit much more quickly. Aisaka, to contrast, is a complete basket case at the beginning of the series, and by the end—with help—she’s pulled herself together and made herself into a functioning human (and in a reasonably gradual, realistic way at that). Ami is less interesting, but then she’s cast as a bitter observer silently wanting to be an insider from the start. This all plays out reasonably well, with particular points going not just to one vicious girl-on-girl brawl (I score highly for any show in which, after the dramatic romantic dustup, the guy is crying in a heap with his friends consoling him, while the girls are in a bloody, no-holds-barred street fight), but the fact that there are some much-less-exaggerated snippy, sarcastic yelling matches between girls. Those girl fights were unexpectedly realistic (thinking about it, you don’t actually see that kind of thing outside reality TV all that often, particularly in anime), although that’s true of a lot of the emotional drama. One big plus in the adolescent angst is that, in this case, there’s a decent reason for at least a lot of it—these people have serious family issues. Not of the shoujo “my dad is trying to take over the world” or “I’m in love with my sister” sort, just realistically awful parenting and the social ineptitude that comes of it (not to mention, in Aisaka’s case, being desperate for affection and normalcy). Good parenting is not a familiar concept to these people. Speaking of which, it’s interesting to note a similarity to NIS America’s other initial anime release, Persona: kids without proper adults to turn to for help. Much more dramatically so in Persona, but even here you have teens with personal problems and no adults to smack them back into shape. The one big exception being Kitamura, who of course does get smacked back into shape by his dad, albeit offscreen. Aisaka and Ryuuji, however, don’t have that to fall back on, so they need to figure out what they’re going to do with their lives on their own. What fundamentally makes all this work is likable, substantive characters. And, with the exception of Ami (who was interesting, but somewhat intentionally not likable other than a degree of pity), they’re all very likable people. Aisaka is particularly unexpected—she looks superficially tsundere, but really she’s just a mess emotionally, and she gets steadily and progressively nicer and markedly happier through the series without ever losing her edge. Gradual character changes like that are rarely handled so well. I also like that she’s hugely affectionate with Minori from the start, showing what’s inside when she’s not overwhelmed by undirected (yet understandable) anger at life. 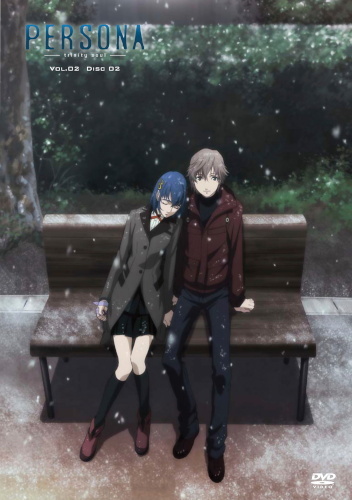 I also really liked the central romance once it finally got somewhere, probably in part because while I’m nothing at all like Ryuuji I made similarly major life decisions at about the same age and happen to have ended up with a similarly miniature, somewhat ornery girl (every one of those looking-down-at-your-girl shots rang all too true). 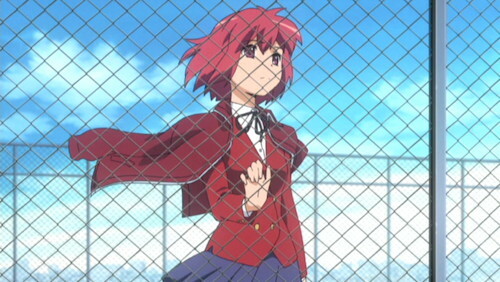 Random thought: One thing that Toradora played with but never really showed its whole hand on was Minori and Aisaka’s relationship. Minori offhandedly said halfway through the series that she liked girls and was jealous of Ryuuji and Taiga’s relationship; Ryuuji takes this as more metaphoric, and based on the end that was probably the intent—she says she likes Ryuuji and it’s implied her jealousy is because she’s Taiga’s BFF but Ryuuji is the one who helped her get her life together. But, if you want to read between the lines, you could very easily interpret all of Minori’s awkward behavior throughout season 2 as her having been completely truthful and it actually being Taiga she was in love with. If anything, that works a little better with what we see of her behavior. Obviously not, and I was happy with where the series ended up, but you’ve got to admit if it had gone nuts with the character relationships and had Taiga end up with Minori, Ryuji end up with Ami, and Kitamura chase his love to America, that would have been completely awesome from a “Didn’t see that coming, did you?” perspective. Final aside: I really like the character animation, and I particularly liked how after mentioning in the first episode that Ryuuji is self conscious about his eyes and tries to hide them with his bangs, this is never once brought up again yet consistently, right up to the end, he fiddles with his bangs every time he’s feeling self-conscious around a girl. Really nice touch that works because they didn’t keep telling us why he was doing it. Come to think of it, the Tiger-Dragon pairing (hence Toradora) analogy is mentioned at the very start and then not again until the final episode. Unexpected, again in a good way. Overall, I liked this show a whole lot more than I was expecting to, although if you don’t know what you’re signing up for when you start watching you’re likely to either hate the second half or give up in the first few episodes, before it gets to the emotional meat.